Underline the fast part in breakfast; most mornings are a race out the door. So let’s make a detour this morning from the donut or bagel shop and grab a few ingredients including quinoa to make a healthy breakfast. 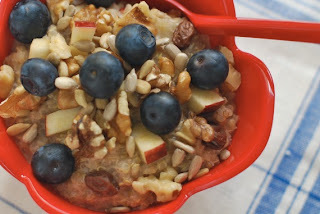 · Cut the apple and add the cinnamon and agave or maple syrup the morning of. · You can add different nuts like walnuts. You can add any fruit or combination you would like this is just a starting point, add banana’s, or fresh berries. Recipe by Kimberly Ignas CNP, NNCP adapted from Hayley Shwaizer CNP recipe.